I have to admit the last year or so haven't been very good for my two favorite distilleries, Ardbeg and Laphroaig. Generally an honest, if not a tad overzealous, fan of anything to come out of these two Islay giants I had been having a hard time justifying my obsession. 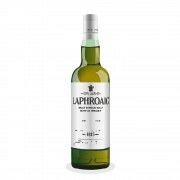 Laphroaig, too, had a less than stellar year, in my opinion. Of the new releases the Cask Strength series are quite noteworthy. However, I wasn't very taken with last years' Cairdeas Edition - the 2013 Portwood. Quite weak and listless and representing just a shadow of the great flavors this distillery produces year after year. This was followed by the QA which, in my opinion, is possibly one of the worst whiskies to be released to an unsuspecting public. This was followed by the Laphroaig Select which has, to put it mildly, been described as 'tepid bum water'. So you can imagine my growing sense of dread as I began to fear if I would ever taste anything sublime with the word 'Laphroaig' on it. Well, I should not have worried. 2014's Feis Ile, the Amontillado finish, is quite possibly one of the best whiskies to come out of Laphroaig. Matured in first-fill bourbon casks and then finished for a year in Amontillado wine there is a complex brilliance to this spirit. I didn't score this quite as highly, but I wanted to mention that your notes matched mine extremely closely. Believe it or not, I even wrote 'garam masala' in the nose. "Spot-on!" Thanks for this. I may have to reconsider before they are sold out. The 2013 vs 2014 Cairdeas is a debate that I have been in many a time. The only answer is individual palates. Some swear by the Portwood (I don't) while some prefer the Amontillado - like me! And to be fair I went back to the Portwood a number of times and did not really change my mind. The Amontillado was still a better whisky for me. So I may like it while you may not. Try and get hold of a sample if you can. The decide. That sounds like the best (and most fun) way to find out for sure! I'll have to track it down soon before this edition is also gone for good. @MaltActivist, thanks for a fun review. I hope to get a taste of this one one day. @Victor You should be able to find it still, in the US (more easily than in Europe for example). I find it somewhat close to your Uigeadail L10 151 but spicier and less cane-sugary, so you might want to just get a taste sample if/when you can.